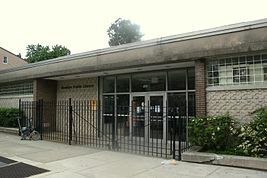 Windsor Terrace’s first library service began in 1922 with a deposit station that housed a 3,000-book collection in a pharmacy. The most notable later move was to a library created from two abandoned street cars. The present 7,000-square-foot library opened in 1969 after a local campaign to upgrade the library service. With the addition of two new self-check units, the branch continues to serve the local community providing technology as well as traditional services.